US manufacturer of submersible pumps, Franklin Electric, has upgraded its SubDrive Utility variable frequency drive (VFD) to include a submersible permanent split capacitor (PSC) and surface pump functionality. The VFD is now able to turn a variety of conventional water pumping systems into constant pressure systems, including 2-wire submersible pumping systems ranging from 1/3 hp up to 1-1/2 hp, along with 115 V and 230 V single-phase 2-wire submersible PSC, above-ground booster, and jet pumps with overload current ratings from 4.6 A to 13.1 A. 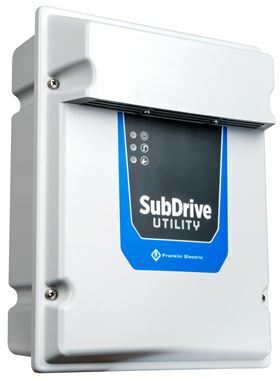 Current drives in the field can access this same functionality through a simple firmware update located in the Downloads section of the SubDrive Utility product page on the company’s website. SubDrive Utility features a NEMA 3R enclosure, rated for both indoor and outdoor use, which retrofits to most submersible pumping systems using a Franklin Electric 2-wire motor. The company says the drive makes troubleshooting and maintenance of the pumping system simple. In cases where the pump and or motor requires replacement, it is fully functional with the new products. Standard mesh screens minimize intrusion of insects and other performance inhibiters while still allowing for optimal cooling of the drive.